Under the direction of Marie Speziale (third from left), a quintet featuring Rice alumni and graduate students made its way to the U.S. Virgin Islands to perform during the 350th anniversary of the St. Thomas Reformed Church. "The organist/choirmaster had heard of our successful brass and wind chamber music program at the Shepherd School from industry professionals," Speziale said. "So as the committee planned this special celebration, they reached out to me to arrange for one of our groups to perform. 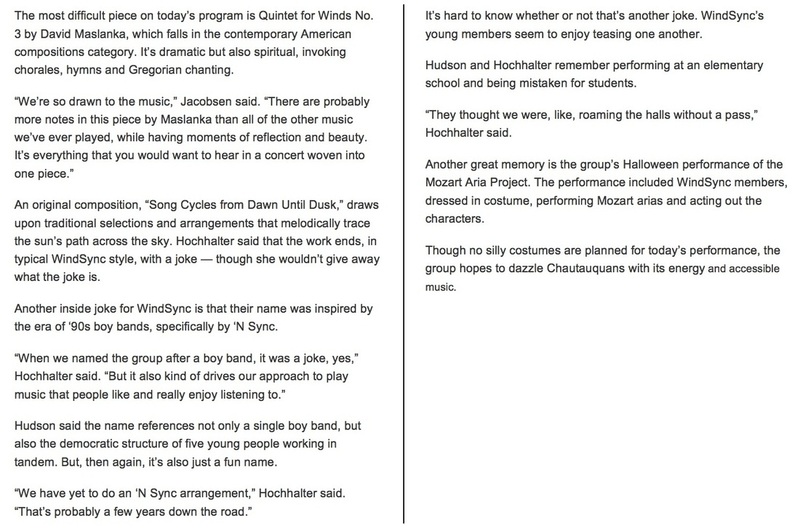 "The chosen quintet, WindSync, performed the anniversary celebration's finale concert Dec. 11, with their arrangement of "West Side Story." Known for combining old and new repertoire, WindSync performed in an interactive fashion that aimed to expand the woodwind quintet repertoire and unveil a musical art form to stimulate public engagement. "WindSync always tries to channel new levels of artistic output and innovative presentation when putting on a concert production, but they outdid themselves with this performance, acting, dancing and singing so enthusiastically," Speziale said. "Even though I've had opportunities to perform all over the world, this experience will stand as one of the most remarkable for me. "It was an enormously gratifying experience and one that was accompanied by great pride to see them challenge themselves and enjoy such enormous success." The ensemble features Shepherd School graduate students Garrett Hudson on flute and Kevin Pearl on oboe and alumni James Johnson '09 on clarinet and Tracy Jacobson '10 on bassoon. Rounding out the quintet is Anni Hochhalter on French horn. "Rice is such a powerful launching tool for its students," Speziale said. "WindSync members are full-time musicians throughout the city of Houston, maintaining teaching studios and performing professionally in the area." But Speziale's biggest point of pride in the quintet is their outreach efforts. The group performs weekly outreach seminars in Houston public schools through the Young Audiences of Houston program. Those efforts were on the musicians' minds during their trip this winter as they worked at the Montessori School and a Sunday morning church service. "The community had an incredibly supportive response to the concert and the outreach efforts and that made every moment of the process worth it," Speziale said. 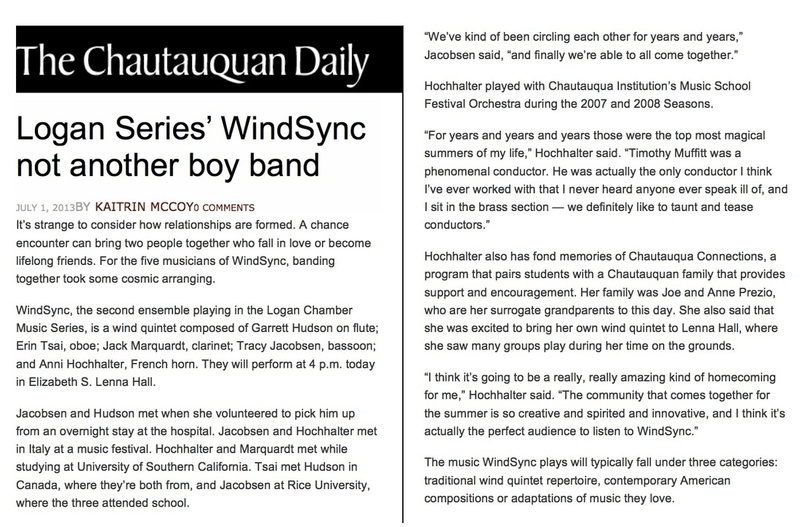 "We loved having an opportunity to share something that means so much to us, and then to know that the audience was so appreciative of WindSync's efforts." Anyone who thinks classical music is in trouble has not spent an hour in a room with WindSync, a group of energetic young musicians trained at Rice University's Shepherd School of Music. This upstart woodwind quintet has big plans, bold ideas and major designs for the future of classical music. The quintet is about to launch its first tour through The Music Bus, an innovative outreach program. Move over Justin what's-your-name with the hair. Meet the highly accomplished artists of WindSync. Tracy Jacobson, WindSync and The Music Bus founder, plays the bassoon. She exudes confidence. We should let her take over the banks. Nick Wolny plays the horn and does yoga. In another life, he would be a motivational speaker. 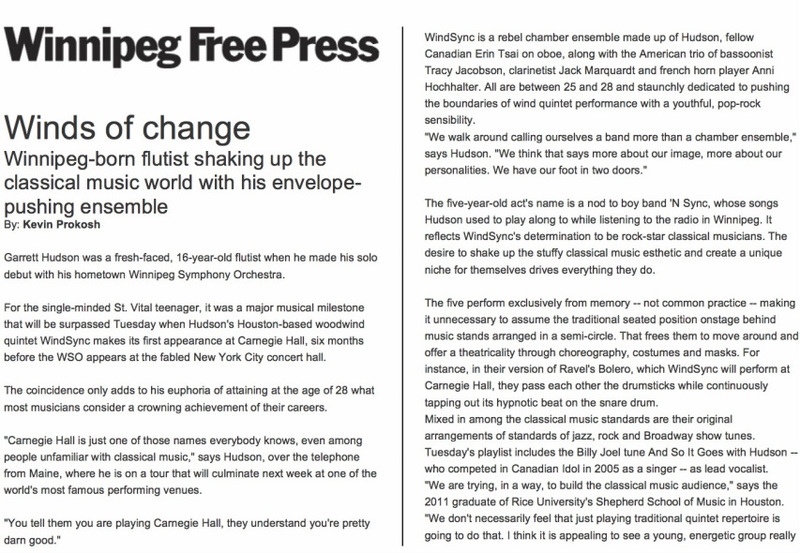 Freddie Blood plays the oboe and helped develop the troupe's savvy press kit. She looks like Tina Fey. Portuguese native Carlos Cordeiro not only plays the clarinet, he can also dance with it, seamlessly combining movement with music. Any mom would trust their child to Canadian Garrett Hudson, the flutist. He's calm, positive and quite possibly the glue of the operation. Together they are about to take the world, or at least New Jersey, by storm. On Saturday at Te House of Tea, they launch The Music Bus tour, consisting of 11 days, four states, seven cities and nine events. "Actually, we are flying," Wolny admits. "The Music Jet tour didn't quite sound right." Jacobson founded The Music Bus as a way to bring classical music to the people. She partners with local musicians, students with arts management aspirations, and presenters in creating lively events in both conventional and nonconventional settings. 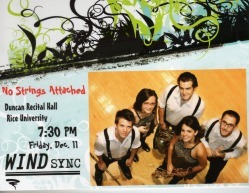 WindSync is a play on 'N Sync. Think boy band with babes. "We definitely use the word 'band' to describe what we do," Jacobson says. "We base our marketing in a popular culture model. It just sounds different when you say you are in a band.'" But don't think for a second they aren't about serious music. "We aim for consistent high integrity," Wolny says. It's no wonder the quintet is pumped, they have just wrapped up "Wind in Tights," a world premiere of Garrett Schumann's The Ballad of Robin Hood at Duncan Recital Hall. They are not kidding about the tights. WindSync is all about adding a touch of theater to their shows. Tights, blond wigs, rabbit ears, actual stage blocking, we are talking about a whole new approach. Once they work out the details of stage movement they bring in a faculty member to help with direction. "We have some limitations as far as movement due to our instruments, " Wolny says. "But it's way better than if we played piano." They even founded a new genre they call a "Quintopera." "We had to commission a theater piece because they don't exist yet," Hudson says. Agile movers all, they experiment with each new piece to see just how much movement is possible while still having it be about the music. Cordeiro recently performed Karlheinz Stockhausen's highly physical The Little Harlequin during a Musiqa concert. This is one fit group. The response has been big. The interactive element appeals to audiences of all ages. Although Jacobson serves as the group's manager, the entire group takes responsibility for its image. They embrace social media with enthusiasm. "Ours may be the only concert where you can keep your phone on. We put our program notes online so you can follow during the show," Jacobson says. YouTube has been another way to get the word out. So far, two of their pieces have collected 1,140 views. Take that classical music naysayers. WindSync is emblematic of a new direction in classical music education, which includes entrepreneurship in the curriculum. "Groups who form before they leave school often have an easier shift into the professional world," says Janet Rarick, Artist Teacher of Woodwinds and Professional Development. "Then they have a musical and social safety net in place to carry them through, along with some real world experience promoting themselves." Rarick, a mentor to the troupe, has spearheaded an effort at Shepherd to better prepare musicians for the professional transition. The website she developed, Navigating Musical Careers, is a model for looking at all the skills a musician needs to succeed, from injury prevention to business skills. Rarick organized Shepherd Careers Forum '07, a groundbreaking conference on professional development in classical music. Nearly everyone in the group has taken Rarick's class. They are fully equipped to enter the world where music is not only an art but also a business. The fact that there's only one full-time woodwind quintet in the United States is not an obstacle. Soon there will be two. They embark on this adventure knowing full well there will be difficulties to manage. Right now they all live in Houston; that may change as members graduate or move on to other jobs. "I don't see geography as a problem," Jacobson says with her characteristic confidence. The troupe spent time with Dallas Brass and Project Trio to learn more about the process of forming a sustainable operation. They are all about gathering all the information they can from the considerable brain trust surrounding them at Rice. Clearly, there exists some serious concerns on the age and size of classical music audiences. There is no one solution to issues surrounding diminishing opportunities. But we have to take notice when an institution, a teacher and a newly formed quintet charge full steam ahead. If you miss WindSync's launch, catch them on the other side of the tour on May 4 at 12:15 p.m. at Methodist Hospital. Right now, the world is saying yes to WindSync — young, talented, determined, sure looks like the future to me. The wind instrument quintet WindSync from Rice University came to Drexel April 28 while on their northeast tour. The Music Bus Tour is the result of a non-profit organization that funds a chamber music group tour, promoting community outreach and concerts in new and different venues. WindSync, composed of Freddie Blood, oboe: Carlos Cordeiro, clarinet: Garrett Hudson, flute: Tracy Jacobson, bassoon: and Nick Wolny, horn, had a busy schedule planned for their day at Drexel. They started off visiting the Drexel student radio station, 91.7FM WKDU, and performed a few compositions live on the radio. Later in the day the quintet was scheduled to work with the non-major band, which was followed by their evening recital at the Anthony J. Drexel Picture Gallery in the Main Building. 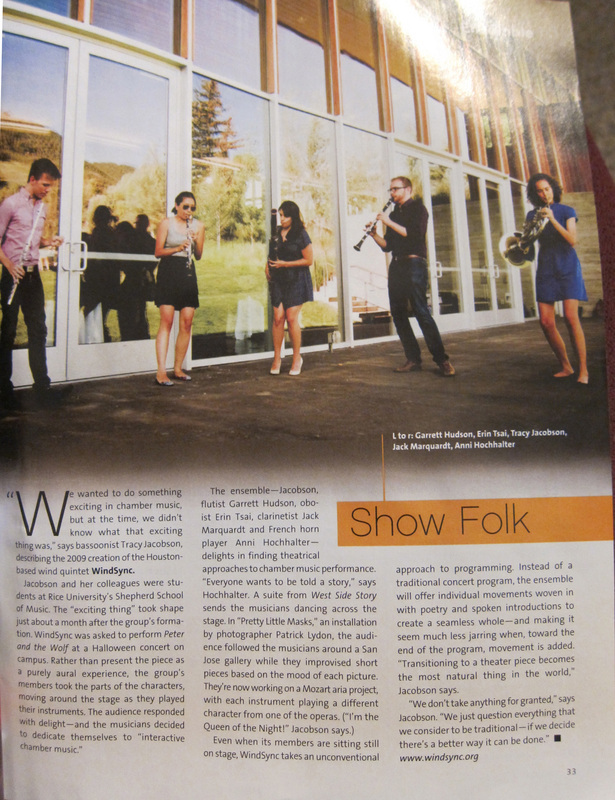 On this tour, WindSync played in four states and seven cities, for a total of eleven concerts. Two of these shows were part of the program "Music for Autism," in which they played for Autistic children who may not be able to function in a conventional performance space. Media Credit: Tara Giancaspro The Anthony J. Drexel Picture Gallery was filled with the music of Rice University's Texan wind instrument quintet. Currently on The Music Bus Tour, their performance at Drexel last Wednesday was one of 11 stops through four states and seven cities. "This program creates performance spaces where those people can go, and they can express themselves. And if the music makes them … speak or sing or dance in their seats, they can do that," Wolny said. He describes these events as a "safe-zone" for those with autism to have the opportunity to listen and interact at a live concert event. Wolny remarks, "It was very challenging because the first concert that we did, the concert in Houston, was a comparatively large concert. There were maybe 100 to 125 guests there, and we were performing, and the kids would just come up to you and try to pull your instrument out of your hand while you were playing." Although the group admitted that these performances were different circumstances than usual, they found the experience to be, overall, very rewarding. Hudson said, "In our performances we try and strive for an atmosphere that isn't everybody just sitting quietly in their seats … to have people that were actually interacting with us and really physically showing us how the music was affecting them is basically what we're aiming for in our project and in what we do in our music." Another stop on the tour was a visit to the Cleveland Correctional Facility in Cleveland, Texas where WindSync played a concert for a group of about 150 inmates. "We were a bit hesitant at first, even going into that environment because we had to go through airlock, and they wouldn't let us bring in any of our belongings," Jacobson said. "Only the instruments, the music and your identification, which they took at the door," added Wolny. Despite these apprehensions, the group seemed proud to have followed through with the experience. Jacobson stated, "It was great to get to play for those people, and they were so appreciative." After their performance, the musicians joined the inmates for lunch at the prison cafeteria. Hudson described this experience saying, "We all sat at different tables with different groups of inmates and … got a very personal look at … where they were in their lives and what they were expecting to happen for them, because many of them are on the brink of being released … They're all so positive." The best part for the group, however, was the inmates' responses to their performance. After each piece, they received a standing ovation. Wolny depicted the emotional responses of the audiences, saying, "There were inmates who came up to us who said, 'You know, I haven't heard live music in 20 years. I had forgotten what this sounded like … and felt like.'" The mission of the Music Bus Tour was to "promote alternative audience engagement and get communities that don't usually listen to classical music [to listen] to classical music, but not in a forced sort of way," Jacobson said. The group definitely achieved that goal, partly due to the success of their unique and accessible performance style. The recital in the Anthony J. Drexel Picture Gallery was an interesting mix of traditional classical music with a youthful flare. Their two-part performance was comprised of an opening sequence of classical compositions from various parts of the world, followed by a musical and theatrical performance entitled "Winds in Tights." This second part of their performance was based on the story "Robin Hood." The group explained that the idea was inspired by the classic children's story of "Peter and the Wolf," with the instruments representing the characters in the tale. The arrangement was by Houston-based composer Garrett Schumann and was commissioned by The Music Bus Tour for WindSync to perform. After a short intermission, the musicians came out clad in the green tights, and clarinet player Cordeiro was decked out in a medieval gown and flowing blond wig in his role of Maid Marion. The group used their instruments to convey the tone of each scene, accompanied with narration, to make the story come to life. The performance was a lively interpretation, one that both classical and contemporary audiences could appreciate. WindSync wrapped up their northeast tour May 4. To see a blog of their journey, as well as footage from their performance at Drexel, visit www.themusicbustour.org. Friday, April 2, 2010 at 7:30 p.m.
HOUSTON –WindSync, an innovative woodwind chamber music group, is back by popular demand at Duncan Recital Hall, Shepherd School of Music, Rice University on April 2 at 7:30 p.m. The performance features a world premiere of Garett Schumann’s The Ballad of Robin Hood. The piece is a WindSync commission, expanding the repertoire of music for woodwind quintet that includes dramatization and choreography. It chronicles the fable of Robin Hood using innovative musical and visual techniques. The program also features works by Heitor Villa-Lobos, Franz Danzi, Jacques Ibert, and Gary Shocker. The concert is a fundraiser to help send WindSync on a tour this summer of schools and public spaces in order to educate people about classical music and create fun and engaging outreach performances. They are designing this tour through the program, The Music Bus Tour, which is a local organization that creates opportunities for professional music students to gain entrepreneurial skills. This concert is free, but there is a suggested donation of $10 per person. A fresh and lively ensemble, WindSync uses standard and contemporary chamber music as a vehicle to explore new audiences and venues for classical music. WindSync is committed to educational enrichment, traveling to Houston public schools and presenting outreach concerts. Driven to expand the woodwind quintet repertoire, WindSync has commissioned Houston composer Garrett Schumann to write a musical drama of the story of Robin Hood. Friday, December 11, 2009 at 7:30 p.m.
Wednesday, December 9, 2009 at 8:00 p.m.
HOUSTON – WindSync, an innovative new chamber music group, performs engaging choreographed dramatizations, many of which, written by local composers. Their purpose is to create accessible classical music concerts that are exciting and interactive. No Strings Attached includes the popular piece by Prokofiev, Peter and the Wolf, which comes alive with costumes, narration, and choreography. It is perfect for introducing children to wind instruments, but also entertaining for a more knowledgeable audience. Also being performed on this program are works by Astor Piazzola and Paquito D’Rivera among others. Bye Bye Bye is the first of many concerts to be performed by WindSync in a non-concert hall setting. This is part of the group’s initiative to reach audiences that would not necessarily be open to a traditional classical music concert. The performance includes works by Gaetano Donizetti, Anton Reicha, and David Maslanka, among others. Both of these performances are raising money to send WindSync on a tour this summer of schools and public spaces in order to educate people about classical music and create fun and engaging outreach performances. They will be doing this tour with the program, The Music Bus Tour, which is a local organization that creates opportunities for professional music students to gain entrepreneurial skills. There is a $5 cover charge for Bye Bye Bye at Te’s House of Tea. A fresh and lively ensemble, WindSync uses standard and contemporary chamber music as a vehicle to explore new audiences and venues for classical music. WindSync is committed to educational enrichment, traveling to Houston public schools and presenting outreach concerts. 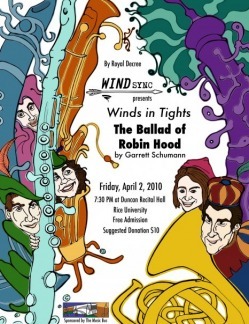 Compelled to expand the woodwind quintet repertoire, WindSync has commissioned Houston composer Garrett Schumann to write a musical drama of the story of Robin Hood, which the ensemble will premiere in Spring 2010.